A suspected chemical incident forced the evacuation of London City Airport, with people needing treatment for breathing difficulties. 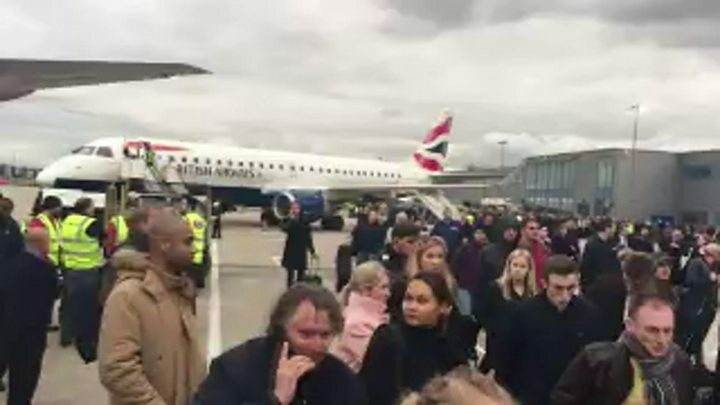 About 500 people were taken from the east London airport at 16:00 BST after some passengers felt unwell, London Fire Brigade (LFB) said. Ambulance staff treated 26 patients at the scene, taking two to hospital. The airport was declared "safe" at about 19:00, with police finding what they think might be a CS gas spray. In a statement, the Metropolitan Police said they are not treating the case as "terrorist related". The force statement continued: "A search of the airport led to the discovery of what is believed to be a CS gas spray. "Whilst the cause of the incident has not yet been confirmed, officers are investigating whether it was the result of an accidental discharge of the spray." The airport said it had since reopened, although passengers have been warned to expect disruption as flights will be staggered. In a statement, the fire service said: "Two complete sweeps of the airport building were carried out jointly by firefighters and police officers, both wearing protective equipment. "No elevated readings were found and the building was ventilated, searched and declared safe." Earlier in the afternoon, the LFB said it had sent appliances used to deal with chemical incidents to the airport. An airport spokesman said the evacuation took place after a fire alarm was set off. David Morris, 28, had been checking in for a BA flight to Edinburgh when he started coughing. He said: "We were queuing up and we were just about to check our bags in, and I was talking and started to cough to the point I was not able to keep talking. "It was getting quite bad and we saw other people starting to cough at the same time. The people behind the desk were coughing the most and quite aggressively. "Within two minutes, they shouted for everyone to get out." Mr Morris added that whatever was causing people to cough did not smell or have any colour to it. "Everyone was shouting and rushing towards the door," he added. Boxer David Haye who was at the airport en-route to Scotland tweeted: "Gutted cant get to Scotland for @JoshTaylorBoxer fight tonight. As #CityAirport got evacuated when everyone started coughing uncontrollably!" Chris Daly, 35, from Southend, told the BBC he had just landed from BA flight from Glasgow when he heard the fire alarms. "When we got into the airport terminal building we could hear the fire alarms going on, then there were announcements in three different languages saying this is a fire alarm and the crew were directing us at the baggage carousel to evacuate the building," he said. "We are now all standing on the tarmac under the wing of the airplane because it has started to rain. "I can see some planes circling in the sky but nothing else has landed. No-one has really told us anything. We saw some fire crew going inside to do a sweep." SNP MP Calum Kerr was travelling with a group of Scottish MPs when they were left stranded on the airport's tarmac for more than 90 minutes. He said: "News agencies were reporting a chemical incident, which obviously changed the atmosphere a bit, people are less fraught - it goes from being a pain in the derriere to a case of: 'Is everybody safe? I hope people are okay'." BBC reporter Andrew Cryne who was due to board a flight at 17:00 BST said people were asked to leave the building at about 16:30 BST. "They said there was a fire, the building was evacuated and everybody was asked to stand outside," he said. "Passengers are waiting, people are fairly cold and don't really know what's going on or whether they may be flying this evening. Many passengers have been advised to go home. 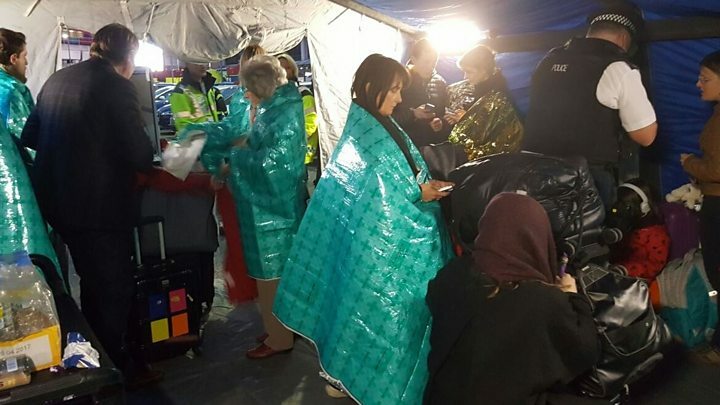 "There have been refreshments handed out, we have been given water, crisps, blankets if necessary, but the mood on the ground is really one of lack of surety and a lack of information." Another passenger Shauna Bull said: "They are starting to take us inside now. "They've separated us into domestic and international and I thought we were going to get to go home but they've taken us into a room for border force control to process us. "There are buses now taking people on toilet trips to a toilet somewhere so I think we could be here for a while yet. No-one is saying anything." London Southend Airport has said it has taken six diverted flights due to the incident at London City Airport, while London Stansted in Essex also took six flights diverted from the east London airport. Are you at London City Airport? Tell us your experiences by emailing haveyoursay@bbc.co.uk.